Are you on the free version of TeamSnap? If so, you’ll love our paid plans even more. They ramp your team communication experience up to 11, and they don’t break the bank, either. Andrea Benton, mom of three kids and founder of Raisingboys.TV, is here to break it all down for you. For starters, one of our most popular paid plan features is our Alert system, which allows you to send important messages out to your entire team in moments. Just compose your message on a phone or desktop, select your recipients and click “Send.” They’ll get a push notification straight to their phone telling them exactly what they need to know. Done! Ever missed an appointment because you just plain forgot about it? TeamSnap won’t let you down. 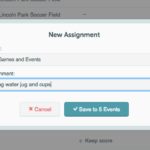 With our paid plans, you get custom email reminders for games, practices and events. TeamSnap automatically messages you a few days prior to your event reminding you when the game is, where it is and what to bring. Finally, our Availability feature is essential for coaches. Whenever you schedule a game, TeamSnap sends an automatic email to everyone on your team asking whether or not they can make it. Once your team members click “Yes,” “No,” or “Maybe” in that email, you’ll have a list showing who’s coming to your game and who isn’t. Ready to get started on a paid plan? Start your free 21-day trial now to try out all our paid features.